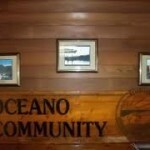 Oceano Community Services District Board members voted unanimously to appoint former journalist Karen White to the board on Friday evening. White was appointed to fill the vacancy created by the resignation of Richard Searcy who stepped down following an alleged drunk driving incident. White graduated from Arroyo Grande High School, worked as a journalist for more than 40 years, and served as the founding chairperson for the Halycon Community Association. Board members interviewed three of the four candidates asking questions about their intentions to run for election in November if not selected and community issues. White was sworn in on Friday evening and will take her seat June 27. Falconbh, your list is right on. Geaslen is a snake. The citizens there want tar and feathers for Tacker and Edwards when they really should be listening…Geaslen blows smoke up the skirt of the Board and it is only Tacker and Edwards calling him on it. Watch the latest meeting where Geaslen spins Tacker’s comments away from hydrant replacement to hydrant maintenance. Watch her nail him on the budget and audit…he has no comment at all. While she may not be totally accurate, she’s the only one asking questions which is kind of a shocking about-face for Mary Lucey; I remember her calling “BS” anytime she saw it. Guerrero is a public defender, what about defending the public’s resources and assets? Hurdle has short-timers, she just wants her term over and Angello can’t be bothered to understand what goes on at the County Water Resources Council, calling it “chaos”. Let’s hope Karen White sees through the smoke and mirrors…she’s a sharp gal. She’s pretty savvy too. Then let’s hope some new blood steps up by August for the November election. Don’t forget, there are 4 sets up (Angello will stay until 2014). I see this as an excellent choice. White is a voice of reason and will add Halcyon representation to the OCSD again. She’s smart and has followed the OCSD for years. Good luck, Karen, and good job by those who selected her.